Included packs; Project 2015 February Kit, Project 2015 February Borders, Project 2015 February Date Pack, Project 2015 February Journal Cards, Project 2015 PreDeco Papers, Project 2015 February Pocket Temps, Project 2015 February 12 x 12 Templates and Project February Extra Paper pack. All 8 packs for one low price of $7.99. You just can't beat that! A little mini bundle that includes Project 2015 February Mixed Media Elements, Project 2015 February Doodled Elements, Project 2015 February Messy Papers and Project 2015 February Inked Bits. You can grab this add on bundle for $4.99 or purchase separately if you desire. Other add on packs include the Project 2015 February Alphas that includes 5 coordinating alphas (in addition to the one contained in the kit! ), Project 2015 February Quick Pages, Project 2015 February Word Art, Project 2015 February Flair, Project 2015 February Embossed Papers, Project 2015 February Cluster Pack, Project 2015 February Facebook Timeline Covers. Each of the Add-On packs can be purchased for $1.79 at this time! Project 2015 February is available at these stores, currently at a 40% savings! Last minute reminder! Connie's retiring products sale ends on January 31, 2015! Be sure to check these out while you still can!! I have several new releases from my Designers and some layouts to share with you today. I started my layout using Truely Template 2, merging the two photo openings into one to better suit my photo. And I added additional clustering. Last week's winner was announced and I am so very excited it was new player! I love when that happens. Here is the new layout with the hidden Mickeys. All the details are on the blog! For this layout, I used Connie's recently released Razzle Dazzle. 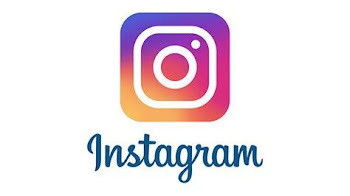 No link is currently available at the time of this post. New releases: Creative Blending Vol 7, Full of Memories Vol 17, Geometric Templates Vol 1 and Multiphoto Templates Vol 7. Each is linked to the Gotta Pixel Store. 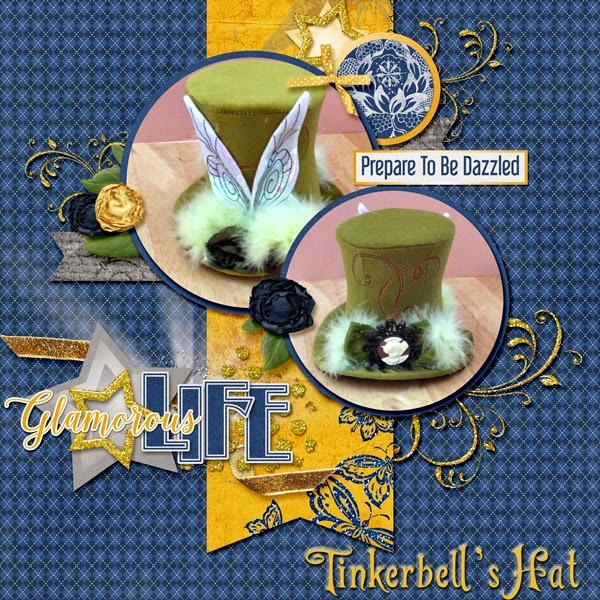 Here is the layout I created for the What The Flick Challenge at Gotta Pixel, using the Creative Blending Vol 7 (Temp 2) and the kit was Razzle Dazzle from Connie Prince. There is still a couple of days to grab these Share The Memories Freebies from My Memories. Every now and then, members of the Gotta Pixel CT are asked to help a designer with layouts for upcoming releases or challenges. 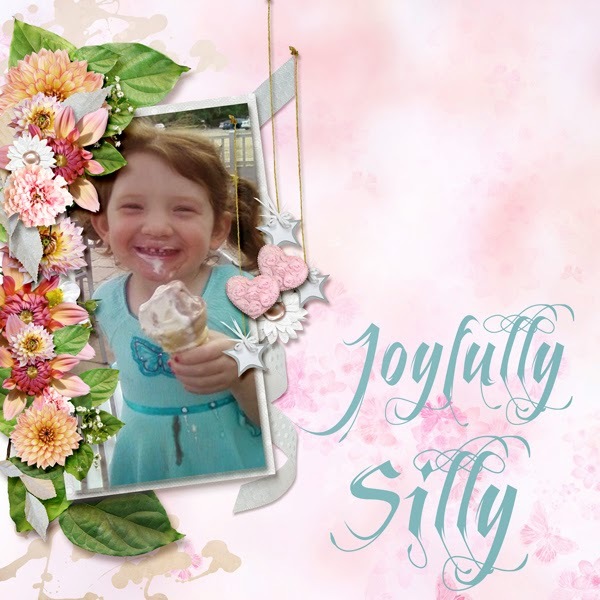 I would love to share with you a layout I created for the Cherish Collection from Meagan's Creations. The packs are available individually or as a collection during the Gotta Pixel Grab It special. Savannah is just so darn cute in that Hello hat!! I felt the need to create a layout today. Actually, I ended up doing several. But I really did want to share this particular one. I started out with Template 4 from A Distant Memory by Brenian Designs. I chose Magical Midnight Bundle from Lara's DigiWorld. It's Dawn and Savannah, way back when. While I was looking through the iPhoto Libraries for my photo, I ended up accidentally playing a video of Savannah really putting up a fuss. Joe and I laughed and told Savannah that noise was actually her. She came running over to see. The movie was of Savannah getting her diaper changed by one of the nurses. My first layout of the day, at about 6:30 AM actually, was for my Sunday Blog Post, Sunday Funday. 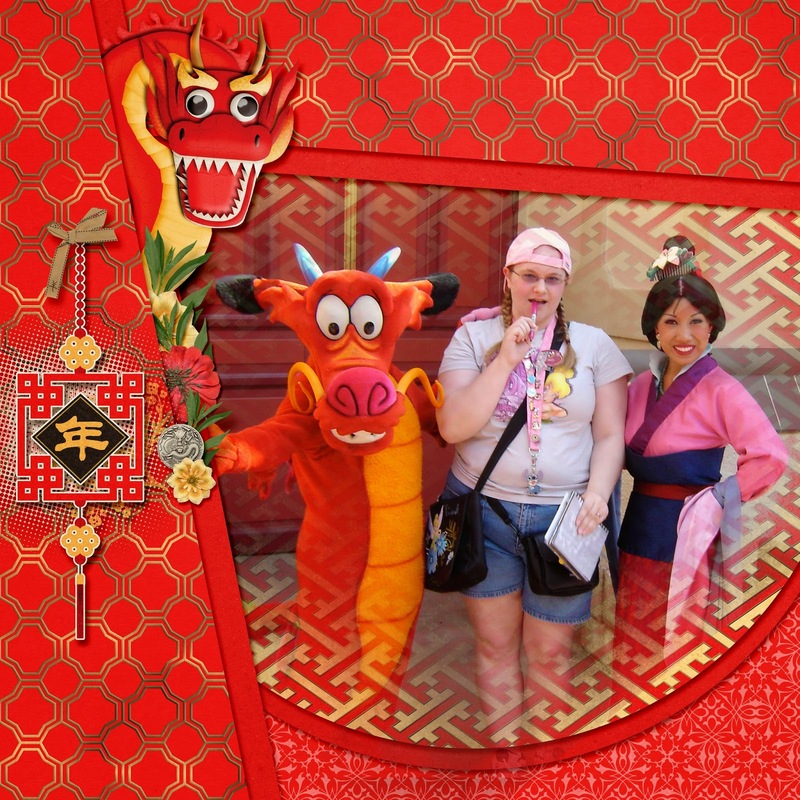 I loved the dragon in Connie's new collaboration, Chinese New Year, with Meagan's Creations. It just SCREAMED Mushu to me!! Be sure to stop over and enter for a chance to win that weekly $10 coupon from Designs By Connie Prince. Full details are on Connie's Blog. Click on the layout to head over to Connie's! 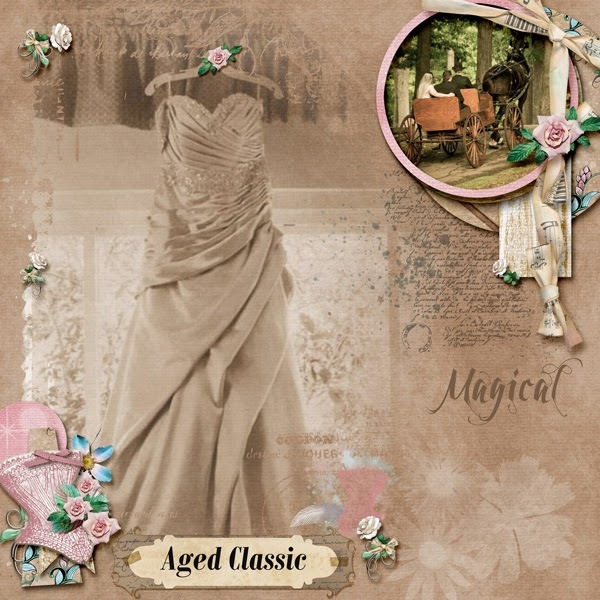 Today, I am so very pleased to share with you a new layout I created using Vintage Chic from PBDesigns. I chose to use a template for this layout, selecting from Creative Blending, Vol 2 by PrelestnayaP Designs. Happy New Year! Designer Updates On My Awesome Designers! First, I would like to wish each and every one of you a Very Happy New Year!! Seems like 2014 just flew by and here we are in 2015! The New Year is bringing some important and exciting changes for the Creative Teams I am fortunate enough to participate on. I will highlight the changes below, and I believe I have all the sidebar links caught up to the recent changes! Designs by Connie Prince is closing her store at GoDigitalScrapbooking. No problems or particular reason. Just time commitments. Another change will be seen in Connie's Friday night chats at Gotta Pixel. Chats will be occurring on the FIRST and THIRD Fridays every month at 8 PM Eastern. Again, family commitments are coming into play here. And we all know how important our family commitments are! Christaly has opened a new store at Digital Crea. A very exciting venture. She also has a shiny new blog (Designs by Christaly) and has begun to post Sneak Peeks with opportunities to win the upcoming releases free. Details are posted when applicable on her blog! 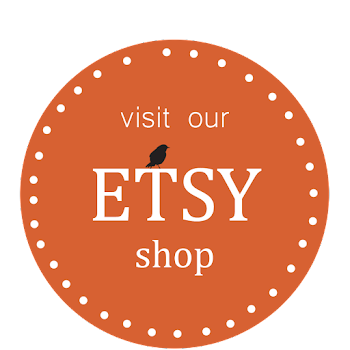 Created By Jill has gone exclusive starting January 1, 2015 at PickleBerryPop! Her other stores and galleries are slowly closing out now. The Creative Team is looking forward to a wonderful New Year with this change!! The entire store at PickleBerryPop is on sale until January 7th! Lastly, I am delighted to take on Freelance Creative Team for Brenian Designs. Freelance so that I have flexibility in the requirements for the Creative Team at this time. I am sure most of you aware that we have experienced some "life" issues in our home, and that coupled with a surgery and now another hospitalization, I am struggling to keep up on my commitments. You may have noticed that a couple of my designers have disappeared from my role of Creative Teams. It was with great sadness and thought I made these selections. I have an open door to return with most, but I want to do the best I can for my ladies, and I just don't feel I have been doing that right now. I am doing what I can to resolve that. Just know that I work with the best and most understanding designers in the industry! 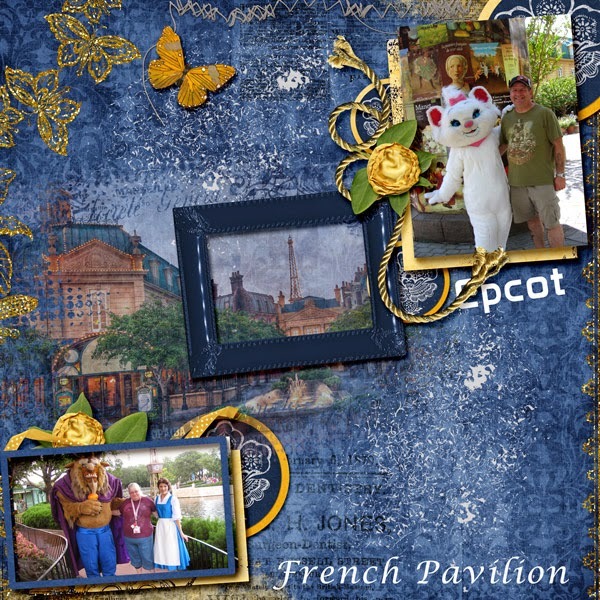 Meanwhile, Brenian is exclusively available at GoDigitalScrapbooking. Believe it or not, those exclusives are great not only for the Designers but for the Creative Teams! The Team is very excited about this venture. During Brenian's Grand Opening Sale, her store will be on sale at a 50% Savings! All month, so take advantage! There are some exciting templates coming up real soon!! I think that covers the important changes for the beginning of this year. I know we are looking forward to an exciting year at Gotta Pixel. Stacy has some pretty neat things lined up for the year. In my next post, I hope to include more information on new releases and some layouts for my ladies.